You don’t need to be convinced to upload videos to YouTube. You already know the value of the most powerful video-hosting platform. The real challenge lies in getting your videos viewed and ranked. Input and output components have been covered elsewhere – create videos that raise brand awareness and drive traffic to your website. Marketers stumble in the center where each aspect works together to drive outputs. Views, shares, and links all drive the ranking algorithm. How can we rank our content without these crucial elements? Jump-start the ranking signals by creating them manually. I’m not talking about black-hat spam tactics – I’m talking about old-fashioned elbow grease. Think of it like starting an antique stick-shift truck – before the engine turns over automatically, you have to push it manually to get the wheels moving. If you’re thinking, “I run a hair salon, not a hair school, this doesn’t apply to me,” you couldn’t be more wrong. Running a business requires in-depth knowledge of your craft, and you can share this with the world. Post a video guide about braiding hair or an honest review of a hair straightening product. You might not make direct sales, but a consistent stream of good content will drive views, subscribers, awareness, and traffic. Over time, this will affect your sales as well. Search engines review your YouTube videos similarly to the way they review websites. There are a number of on-page optimizations you can perform that will send relevancy signals to search engines. Provide info – Similar to image optimization for on-page SEO, YouTube looks at the name of your video file to help determine its subject matter. 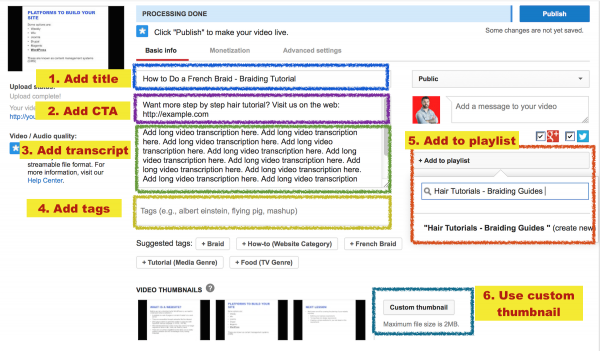 Before you upload your video, right click on the file and select “get info.” Add custom tags, title, and description based on the keywords of your video. Don’t go overboard and resort to keyword stuffing – just use honest and descriptive keywords that describe your video. Expand the title – YouTube pulls the video’s title from its file name. I recommend adding secondary keywords into your title. For example, if you named your video file “How to Do a French Braid,” then title your video “How to Do a French Braid – Braiding Tutorial.” You capture additional keywords without using the same phrase. While your videos should provide great content for users, you’re also running a business. Make sure you drive viewers to an owned platform and get them in your sales funnel. There is no limit on the number of characters in the description. I strongly suggest you take advantage of that. Make sure the content you’re adding is original and not duplicate (Google Panda algorithm penalties apply here as well). I like to add the video transcript in this section. You can hire someone or do it yourself. Tags – Add a series of tags that help further describe your video. Add 8 to 10 tags using your target keywords. Create playlists – Most marketers overlook this part. Adding your videos to specific playlists adds another signal (think of them like you do categories on your blog). 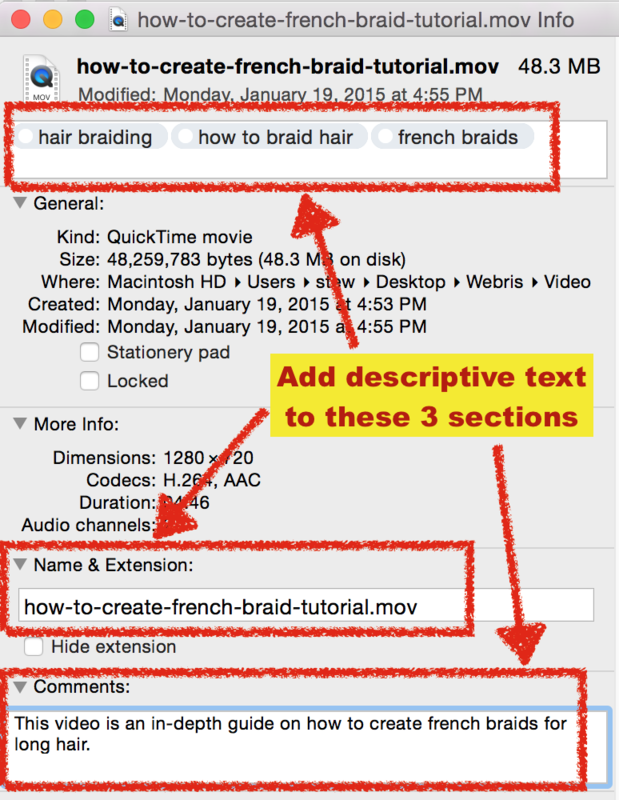 If your video is called “How to Do a French Braid – Braiding Tutorial,” create a playlist called “Hair Tutorials – Braiding Guides.” Just like elaborating on the video title, this allows you to capture synonym keywords without keyword stuffing. Custom thumbnail – Adding a custom thumbnail image will greatly increase click-through rates to your video as this is the image shown in search. Use colors like red, yellow, and green in your thumbnail to help it stand out from other listings in the SERPs. Your channel page also offers other opportunities for ranking and relevancy signals. Add links to your social pages and your website. Include a long description about your channel in the About section. Subscribe to channels with similar content, creating a correlation between their content and yours. The theory is simple – if people are watching your video, engaging with it, and sharing it, it’s worth ranking. It’s your job to distribute your video to get more views. Push to your network – Send emails and text messages to your friends, family, and customers alerting them to the video and asking them to leave feedback. 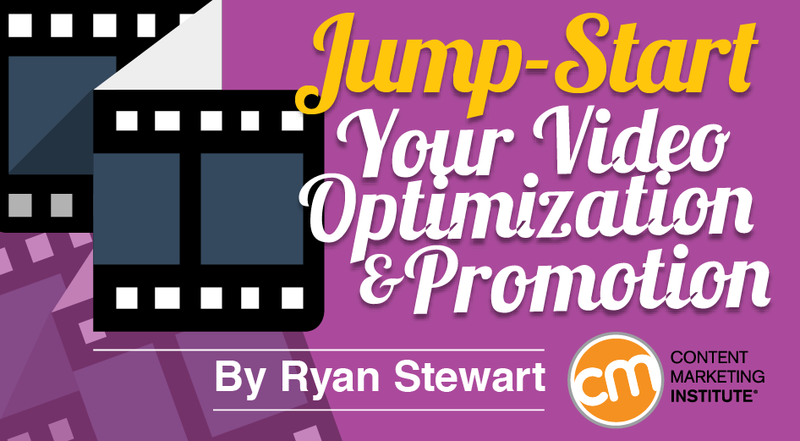 Your network alone should be able to generate a couple hundred views, comments, and shares. Push to owned social – Blast your video across every social media page you own. I use the following list of networks for my videos: Facebook (personal and business page), Google Plus (personal and business page), Twitter (personal and business page), Pinterest, Tumblr, Reddit, LinkedIn (personal and business page), DeviantArt, Blogger, Diigo, Delicious, LiveJournal, StumbleUpon, Scoop.It, and Plurk. Not only do these postings create awesome, high-quality social signals, but some of these platforms create back-links as well. Push to social groups – Social media groups are one of the best-kept secrets for content distribution. If you can find groups relevant to your business you can get hundreds of engaged views, comments, and social shares. I belong to about 20 Facebook, Google+ and LinkedIn groups related to digital marketing. They are highly active and always provide quality engagement metrics on my content. When you use groups, make sure you aren’t just spamming them with links. Take part in discussions, provide value, and get to know the other members. Push to forums – Forums lost some popularity with the rise of social media groups but are still a viable source for engagement and links. Finding relevant forums is easy. Just head to Google and type: Forum + “your niche” and look for ones that are active and updated often. In addition to forums, look for threads on Reddit and Quora. Google search for: site: quora.com + “your niche”. You can often find highly engaged discussions on these networks and dropping a relevant YouTube link is an acceptable practice. Going through the steps I’ve listed will most likely give your video the boost it needs to start being indexed for your keywords. Embed on owned properties – Get the embed code from your video and embed it in your websites. The best way to do this is to create a simple blog post and paste it there. Embed/link from partner properties – If you have any clients, business relationships, or colleagues (hint: network in social media groups) you can ask them to link to your video from their content. Link outreach – This is a tedious task, but when done properly can pay massive dividends. 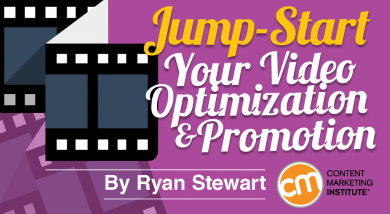 Identify other websites whose content aligns with your video. Send them a nice email telling them about your video and why you think it would add value for their audience. When all is said and done, these are the steps you need to follow to get the ball rolling in the middle of our original diagram (get views, get shares, get links, and ranks in search). As time goes on, this will get easier. The more you post, the more followers you’ll acquire, and the less you’ll have to rely on manual efforts to get your content viewed. Well, what are you still doing here? You’ve got work to do! Video is an integral component of most content marketing strategies. Learn more about content marketing best practices in three free e-courses. These are part of CMI’s comprehensive Online Training & Certification Program, which contains over 19 hours of must-know strategies, tactics, and best practices, delivered by leading experts. Sign up now. Ryan Stewart is a digital marketing consultant with over eight years of experience working with clients like Target and the Department of Defense. Ryan currently resides in Miami where he runs Webris, an Internet marketing agency. Follow him on Twitter.